Mad Smacks. NRG’s First home bout of the year! On the 30th March, Newcastle Roller Girls will be returning to the newly refurbished Walker Activity Dome for their first bout of the year. 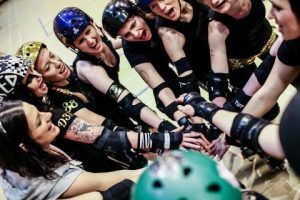 This epic day will start with our B team, the Whippin’ Hinnies versus Fierce Valley Roller Girls, after which our ‘A’ skaters the Canny Belters will be having a rematch against Nottingham’s Hellfire Harlots! (Under 12s have the honour of free entry, however under 16s must be accompanied by an adult). Doors open at 11.45am – Get there early to reserve one of those sought after suicide seats! 12.15pm – Whippin’ Hinnies v Fierce Valley Roller Girls. Advance tickets are no longer available – please pay on the door!